The California Department of Food and Agriculture (CDFA) wants to spray known toxins in the back yards of many homes in the Ojai Valley. They are doing this because they are trying to help the local citrus industry deal with a potentially disastrous problem. If you are in or near a spray zone, the Coalition offers information on the toxins and other alternatives, so you can make informed decisions of how to best support our local farmers while keeping your back yard and home safe for you, your family and your pets. It is our understanding children and pets would be exposed to the toxins, normally referred to as pesticides, as the spraying will involve local spray residues. The chemicals will enter the sprayed trees and some amount can transfer into the fruit. Please read The Science Behind Environmental Application of Pesticides to Stop Invading Insects authored by concerned scientists of Ojai Valley – linked here. You can opt-out, if you are included in the spray program. Learn how to keep your trees from being infected without using toxins so you do not become a source of a problem for our local farmers. Help your neighbors to do both of the above two steps by printing out the report linked above and sharing it with your neighbors. 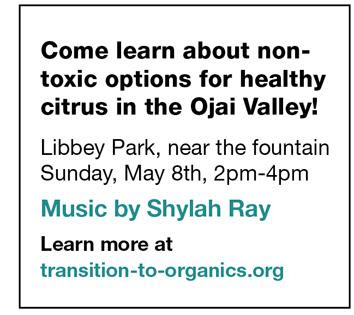 The Ojai Valley Green Coalition is working with several concerned groups to bring the information together and help keep our Valley safe while supporting our local farmers. This challenge cannot be addressed with a one-time email. We will need a lot of support from the community to make this effort work for all concerned. The Coalition would love to hear from you about how you can contribute to this effort. Please get in touch. What is the Asian Citrus Psyllid and Citrus Greening Disease?